I'm going to be talking you all through my skincare routine today. 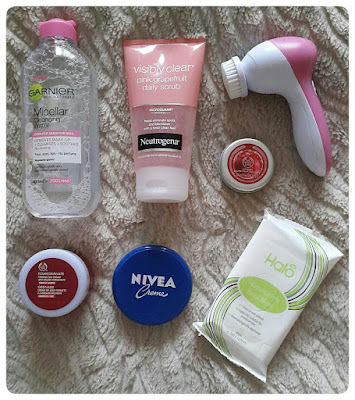 This blog post has been requested so many times since doing my morning skincare routine last year and I hadn't changed much back then so I didn't want to do an updates one until now. I am going to be doing an updated morning routine for you all too (as it's also been requested so much!) which is going to be up on my blog sometime next week (I think!) so don't forget to come back and check if you want to see that. This skincare routine is best for my skin. I don't usually buy high-end designer skincare products as my skin is so sensitive and red that I have wasted so much money in the past buying and trying products that were wrong for me, so now I stick to high-street products and this skincare routine actually works a lot better for my skin. The first thing I do is use my Halo Fragrance Free Facial Wipes which I got free in one of my subscription boxes as it feels like it removes any dirt or oil that I am have got during the night time and it really wakes me up in the morning. I only received ten of these wipes so I'm nearly out and really want to try some more so if you have any recommendations please do let me know by either emailing me in my side message box on my blog page or by tweeting me on twitter. Next I use two cotton wool balls and about three drops on each of my Garnier Micellar Cleansing Water and wipe it all over my face going from my t-zone and working out and down, I really swear by this product! It makes my skin feel fresh, bright, awake and alive and it's just what I need after I wake up of a morning. Then I have a bath, I love having baths of a morning as it really makes me feel calm and positive about the day ahead, and whilst in the bath I use my Neutrogena Visibly Clear Pink Grapefruit Daily Scrub and my Pixnor P2016 Portable 7-in-1 Facial Cleansing System Brush which Phil bought me a little while ago from Amazon. Once I've done that I tap my face with a clean warm wet flannel facial cloth. Pixnor have a sale on Amazon at the moment where you can buy this awesome Pixnor P2016 Portable 7-in-1 Facial Cleansing System Brush for only £8.99 instead of £19.99! WHAT A BARGAIN! I would recommend this to everyone, it's such a good product. Once I'm out the bath, I tap my face dry with a clean fresh towel and use my Nivea Creme concentrating on my t-zone as that's where I get the worst dry and redness, and working my way out. When the Nivea Creme is all dried into my skin I use my Pomegranate Firming Day Cream by The Body Shop and again start with my t-zone and work my way out just like I do with the Nivea Creme. I finish with a lip balm and lately I've been loving The Body Shop's Frosted Cranberry Lip Balm which I got back in November and I still have loads left in it - I haven't even touched pan yet on it. I hope everyone enjoyed this blog, and if you have a morning skincare routine let me know so I can read it? Thank you to Pixnor for sponsoring me to do this blog post, I really enjoyed it.